1. Preheat the oven to 200°C, gas mark 6 and line a large baking tray with baking parchment. 2. Pour the 300g sugar onto the tray and spread it out into an even layer. Place into the oven for 5-6 minutes, or until it feels hot to the touch and the very edges of the sugar are just starting to melt. 3. While the sugar is heating up, place the egg whites into a large bowl or stand mixer. Whisk the whites with an electric whisk until they form stiff peaks. You should be able to tip the bowl upside down without anything falling out. 4. Whisk the hot sugar into the egg whites, adding a spoonful at a time and letting each spoonful fully mix in before adding the next. Avoid adding any of the melted sugar around the edges – this will not dissolve properly in the meringue. 5. When all the sugar has been added, turn the mixer speed up and whisk for 8-10 minutes or until the mixture is really thick and glossy. If you rub a small amount between your fingers, you shouldn’t be able to feel any grains of sugar. If it still feels gritty, continue to whisk for a few more minutes until smooth. 6. Turn the oven down to 110°C, gas mark ¼. Draw a 20cm circle onto a sheet of baking parchment, then place onto a baking tray and pile the meringue mixture onto the circle to make a tall heap. Use a palette knife to smooth the sides and stroke upwards, creating a flick at the top. Bake at the bottom of the oven for 2½-3 hours, then turn the oven off and leave the meringue to cool completely. 7. Drain the lychee syrup into a small saucepan and bring to the boil. Remove from the heat, add the teabags and allow to steep for 3 minutes, then remove and discard the teabags. Add the 2 tbsp caster sugar, return to the heat and continue to boil the liquid until it has reduced by one-third and is thick and syrupy. Allow to cool before adding the lychees and stirring to coat them. Crush one-quarter of the raspberries in a small bowl to make a sauce. 8. 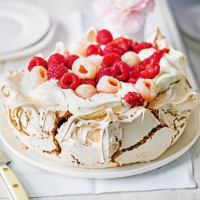 Whip the cream to soft peaks and pile on top of the cooled pavlova. Top with the raspberry sauce, the remaining raspberries and the lychees. Pour over the remaining jasmine syrup and serve. This recipe was first published in Thu May 04 12:45:00 BST 2017.